In 1973, Sandy Sanderson attended the School of Infantry in Gwelo, in what was then central Rhodesia, for officer training. Now, more than 40 years on, he has written a book based on the diary he kept. The result is a frank, detailed and sometimes humorous account of the training as it happened. 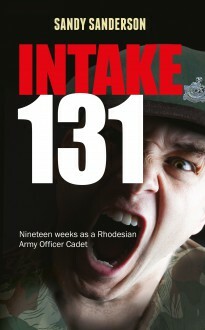 The book will be intriguing to people from all parts of the world with an interest in the military. In June 1977, Time magazine commented, “Man for man, the Rhodesian Army ranks amongst the world’s finest fighting units”. If this were true the training must surely have contributed. Recruits were trained by some of the toughest and most experienced military instructors in the world, all of whom possessed a varied, if profane, vocabulary. As Sandy put it, “Any Rhodesian drill instructor could string a sentence together consisting entirely of expletives, apart from the odd indefinite article, and make perfect sense”. In spite of this they were hugely respected and their expertise undoubtedly saved many lives.